The National Partners Programme was launched in 2016 to mark the 70th anniversary of the Arts Council Collection by creating a network of regional galleries and museums to present and curate exhibitions drawn from the Arts Council Collection. Through a sustained presence at each venue across the three year programme, the Arts Council Collection aims to build a deeper relationship with regional audiences. Building a UK-wide network across regional partners and connecting local visitors to their national collection. The first four National Partner museums and galleries are: Towner Art Gallery, Eastbourne; the Birmingham Museums Trust; the Walker Art Gallery, National Museums Liverpool; and the Collection’s existing partner, Yorkshire Sculpture Park. Round 2 of the National Partners Programme launches in 2019 with three new partners: Firstsite in Essex, Sunderland Culture in Tyne and Wear, and The Newlyn Art Gallery and The Exchange in Cornwall. Details of the Round 2 exhibition programme will be announced later in the year. Sign up to the Arts Council Collection newsletter for regular updates on the programme. Keep up to date and share your experiences of National Partners Programme activity on Twitter using #ACCNationalPartners. Sign up for our Newsletter to receive regular updates on NPP events and exhibitions. Birmingham Museum & Gallery’s latest engagement pilot project sees the gallery’s learning team working with local care homes to explore new opportunities for engaging older audiences. 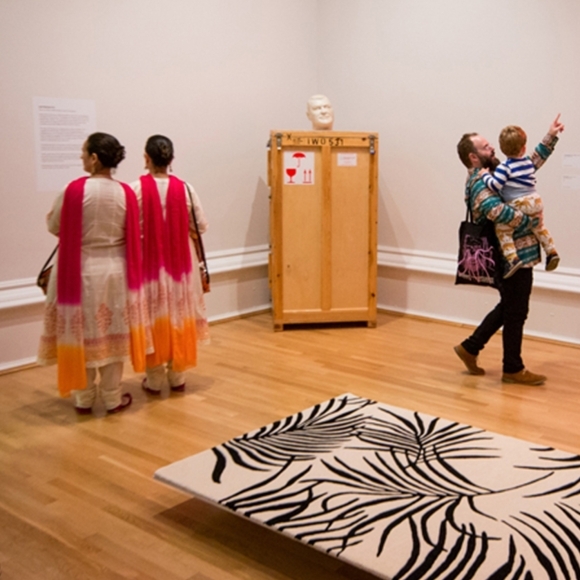 Yorkshire Sculpture Park’s All Aboard programme introduces local families to works from the Collection, through supported visits and a range of family-friendly activities. Walker Art Gallery's Angelica Vanasse explains how the Gallery worked to put engagement activity centre stage as part of their major exhibition, Coming Out: Sexuality, Gender & Identity. Students from Nottingham Trent University, University of Leeds and Manchester Metropolitan University visit Yorkshire Sculpture Park to explore themes of protest in the National Partners exhibition, Revolt & Revolutions. I Want! I Want! features work by artists made over the last 20 years who have all been influenced by the rapid development of technology.